"Hey, dudes, where are we all headed?" "Some guy named Perry Block is tossing bread into the other end of the lake." "Forget that. He only throws stale Wonder Bread and even slathers mayonnaise on it first. What does he think, we're gentiles?!" "Brothers, that's not it! Remember we thought the Sierra Club granola spill had wiped out all the female fish in the pond? Well, we found a female!" "What are we waiting for, let's go!" "She looks like a female Steven Tyler fish." "Oh, no! Perry Block is reading to her from his Halloween opus, Blogpost of Horror." "Reverse course! Time to bottom feed." All right, so I shamelessly took advantage of this week's picture prompt of little fishies in the water to further promote my under-performing Halloween piece, Blogpost of Horror. Our benevolent ruler Rochelle never said we couldn't use the Friday Fictioneers for cheap and tawdry huckstering, and so I have. You should swim on upstream to feed on the entries of the other Fictioneers by clicking on the proper name below. They'll be variegated, free of shameless promotion, and for the most part, free of me and Steven Tyler! Come on, you always find some salacious point of view in ever the most innocent photo prompt. You are a devil and a self promoting devil at that. However, I love the use of Perry Block as a character in the story - and the wonderbread - and the mayo! Thanks, Linda. Well, Perry Block --- foibles and all and there are lots of them --- is at the center of the blog, although I try to write about many things that have nothing to do with the me or the aging boomer motif. Shall I set aside some mayo and Wonder Bread for you with the crusts cut off? Thanks, Sandra. I've got some Wonder Bread and mayo for you too as I read from Blogpost of Horror! Thank you, Ron, looks like blatant promotion works as long as Rochelle doesn't yell at me. Yes, fear is at a fever pitch in Blogpost of Horror especially when President Reagan mouths those horrifying words "Your mother knits socks so well." Thank you for reading and commenting! First you bait the fish, now us. What a shameless act of self promotion. You're an even better baiter than me. I may be just a lowly apprentice or journeyman, but you're definitely the master. Thank you, Russell. Yes, I'm the master of shameless self-promotion that doesn't work. Hell, it's the master of something! 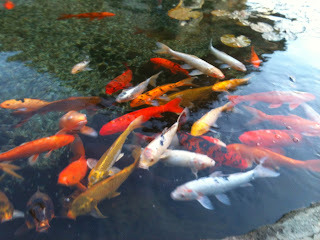 I think the fish retreated because they don't like corn--fun post(s), Perry. Whatever they didn't like, I don't blame them a bit! Free advertisement using fish?? I like it!! Apparently Sam and Margaret (FROM MY STORY! IT'S OVER ON MY BLOG!) are smarter than I gave them credit from. All caps makes shameless self-promotion more effective right? RIGHT? I had to pay them in Wonder Bread, but I was going to throw it out anyway. Already been over at your blog and read the story and yes, the purpose of life is FOOD because we are all food for the next being up in the food chain. That is our purpose. AND WOW,THOSE CAPS DO JUMP OUT AT YOU! Droll, darling... very drolll... and I never did know how to pronounce the little girl from the Exorcist's name, and so I always associated it with Ronnie. Those were great, too. Your stories are always so silly. I liked this one. I did. You tickle me. I read that every time a gentile eats corned beef on white bread with mayonnaise and American cheese, somewhere, a Jew dies. Now there's a horror story if I ever heard one. Your story made me laugh. Perry, no one can fault you for creative self-promotion! The fish cooperated nicely for you. You are one darling I'll never seek to exorcise! Thanks for your nice comments. I'd like to tickle you. At least my story gets to. Too often I only read the Friday fictioneer stories of our little group and often think about visiting for other reasons. Thanks for the invite. I am on my way to check it out. Go right on over! No waiting. No doubt about it, it would have been cruel & unusual punishment for them. Very humorous. Loved the granola reference. Nicely done. Thank you, Tony. It was a frightful granola spill!